Despite being far and away the lead of the charity draw for the 8th tournament slot in this year’s Evo 2013, My Little Pony: Fighting is Magic is being pulled from the running. Instead it will feature in the indie game tournaments and, should Fighting is Magic still hold the top spot and the end of the donation drive, the second highest game will go on to win. I wrote last week of how the 8th tournament of the Evo 2013 contest was going to be selected by a donation drive. Ten different games were in the running and the community which donated the most money to the Breast Cancer Research Foundation would see their game headline the event. 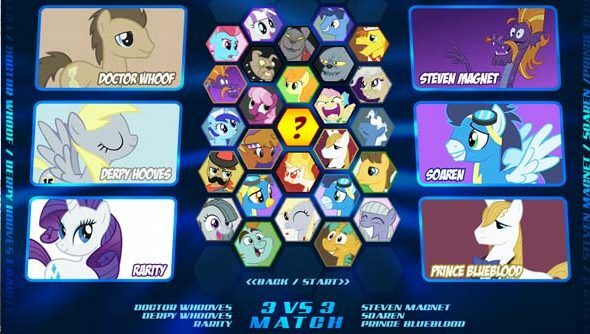 Among the contestants was indie fighting game, MLP: Fighting is Magic, a volunteer-made fighting game rendition of the My Little Pony television series Friendship is Magic. However, it’s not all bad. Should Fighting is Magic win then there will be a separate tournament held as part of the indie showcase. It just won’t be headlining on the main stage. Mane, those other fighting games hoof to do better than that if they want to win, even by a nose.